Welcome to the webpage for Alastair McIntosh's Soil and Soul: People versus Corporate Power, £9.99 from Aurum Press, London, ISBN 1-85410-942-1 (first published Oct 2001). Also as a Kindle e-book (2012). A French translation was published in March 2005 by Editions Yves Michel, entitled: Chronique d'une alliance: peuples autochtones et société civile face à la mondialisation. OK - so let's be honest. I put these book review passages up here to encourage people to buy and read it. The reviews have been very generous. Here's a selection of the very best ... and, for honesty, the very worst. Enjoy the lot! "A beautiful, beautiful book." - Swampy, 15-3-10. "I cannot recommend the book highly enough." - Ricky Ross of Deacon Blue. "A must read, that I believe is as important for our generation as Silent Spring was to our parents. It’s an entirely factual book and yet much of its poetic impact derives from real-life magical realism. " - Kevin Redpath, Film-maker, 8-4-10. 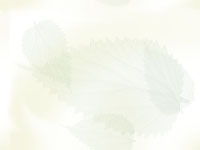 "Read Soil and Soul by Alastair McIntosh.... His book is both elegant and prophetic. There is earth in the ink and, yes, this is the voice crying out from the wilderness. Good bedtime reading in the Outer Hebrides." Rev Peter Owen-Jones, Sunday Times, Sept 10 2006. "im reading a book called soil & soul, by alistair somebody, it is truly mental, thats not very punk is it, unlike mr lydon, who is very punk." - Thom Yorke of Radiohead (voted rock band of the decade), At Ease, Nov. 2004. Yorke adds on the "Links" page of the Radiohead website, June 2005, "ive finished a book by him called soil & soul which was very inspiring... a desire for ecological change with no ego or malignance and no messianic tendendies...and he has a beard thmx." See Daily Record Interview, 8-6-05, but check with my wife to keep his eulogy in perspective! "Your book in these last days has been the heart in my chest. Mesmerising. Expansive. A weave! It linked some of my more lonely thoughts and songs in to an older bigger picture.... Right up there with Herman Hesse." - Luke Concannon, lead singer of the chart-topping duo, Nizlopi, of JCB Song fame, 2004/6. "Marvelous and relevant." - Iain Anderson, Iain Anderson Show, BBC. "... Alastair McIntosh's terrific book, Soil and Soul" - Brian Logan - The Guardian. "A most excellent book. Read it. Peace and goodwill to all" - (the late great) children's illustrator Harry Horse in his Sunday Herald Christmas political cartoon on the theme of 'complicity' with evil, 24 December 2006. "This has to be the book of the decade. Lyrical, passionate and poetic. McIntosh's writing is truly compelling." - Robin Harper MSP (Green Party), Sunday Herald. "Few activists win such resounding victories in their lifetime, fewer still take the trouble to write down how they did it and what inspired them through the dark days. None that I know of have done it with such a natural gift for storytelling. The treasures he finds are gems for any environmental activist in any part of the world." - Jake Bowers, The Ecologist. "McIntosh's new book [is] a powerful addition to the literature of Highland grievance, distinguished for its attempt to set it in a world context and for the fluent grace of the writing. Some of it, I confess, I took with a pinch of impatience. McIntosh writes beautifully about his upbringing on the Isle of Lewis but can arouse irritation when, for example, he interrupts an absorbing account of bringing a stag down from the hill with reflections on the bardic tradition." - Arnold Kemp, The Observer. "Soil and Soul is a beautiful book. The message is beautiful and the writing is beautiful. The message is that power over the land should be given back to those who live upon it, and McIntosh is a good writer - he is where poetry meets science.... Although he is not a Gaelic speaker it is clear that he has deep roots in the place [and] has read what Gaelic scholars have to say.... He weaves in and out between these two issues [Eigg and the superquarry campaigns] in a way that will keep your nose glued to the page, for McIntosh uses a novelist's skills." - Ronald Black, "A' creidsinn ann an slanachadh 's anns an fhearann", The Scotsman (Gaelic Page, translated). "This is a deliciously heavyweight book, rich in substance. It sets the soul aflame and the mind a-dancing. Seriously playful, it opens up new avenues of seeing and hearing, poetic and prophetic ... "dualchas araid agus luachmhor" ... Its radiance pierces the gloomy winter half-light of nihilistic consumerism. Enough flesh on the bone then to sustain us through these love-starved times. O taste and see that God is good!" - Babs Macgregor, Coracle, Iona Community. "The longer-term interest of this book surely lies in the scholarship of its more philosophical sections. We can debate how far the horrifying events of September 11 have really changed the world.... What hopefully has happened is that we are all more reflective about what is missing from our lives, our social and political institutions and our tenancy of the planet [but] remember that McIntosh and his colleagues at the Centre for Human Ecology were there first, notwithstanding their expulsion from the University of Edinburgh, an event which he describes in a remarkably charitable way." - Roger Sidaway, Ecos: Journal of the British Association of Nature Conservationists. "McIntosh is here consciously resurrecting the ancient Bardic tradition of the Celts [asking] how can individuals and small groups stand up against the assault of 'the Powers'? How can people regain their sense of meaning? McIntosh's answers to these questions are perceptive and needed. Read them. Let their essentially spiritual nature influence your own perspectives. And then go out and act for the world." - Noel Charlton, Resurgence. "This beautiful, spiritual book..." Joe Kresse, Timeline, USA. "This is just a beautiful book, a fantastic book, a book that will help reconstitute the world." - Professor Walter Wink, Hudson, NYS, August 2003. "This is a world-changing book; an adventure in theology, economics, ecology, history and politics which seeks to guide us towards a new means of defeating the powerful. One day it'll be recognised as a classic." - George Monbiot, Sunday Express, (Top 5 reads, 15-6-03). "Soil and Soul tackles some of the most timeless issues about what it means to be human, to live and care for this planet, and addresses our own responsibility in this." - Gerry Hassan, The Scotsman, 2-4-11. "Alastair’s book ‘Soil and Soul: people versus corporate power” is hugely important. I rarely do the “fan” thing, but this is one of the best books I have ever read and I have never ceased recommending it to others. His writing, with its lyrical and spiritual power does not demand a shared belief, but a shared sense of values, which I think are hugely relevant today and, in many ways, voice an unspoken cultural yearning in many people. I would be delighted to persuade thousands of people to read (buy!) this book in the certain knowledge it will be good for them!" "A really wonderful and inspiring book [offering] a fascinating perspective on globalization and development from someone who comes from a still intact traditional culture. Highly recommended!" - Starhawk, pers. com., 2003. "Every now and again you read a book which you can describe in no other way than 'life-changing'! Soil and Soul by Alastair McIntosh is such. It was one of the first that I read as I entered the field hedged in by both ecology and theology. It provided a map for my journey. Conversations with the author by e-mail and in person have made a great impact on me." - Bishop James Jones of Liverpool, in "Jesus and the Earth", SPCK, 2003. "Soil and Soul is a kind of No Logo in a Fair Isle jumper; essential reading for anyone who cherishes the hope that humanity can yet triumph over the corporate demon." - Susan Flockhart, Sunday Herald. "It is a beautifully written analysis.... Its thesis is that it is still possible for communities to take on corporate big boys and win ... "turning market forces against themselves"... I warned you." - Antonia Swinson, Scotland on Sunday (Business Section). "It is right and proper that he [McIntosh] now has the opportunity to explain himself and give background colour to these children of the New Scotland to which he has been a key midwife.... Whilst the writing is often painfully overblown, the quality of the narrative carries the reader along if only out of a sense of curiosity to see how long he can sustain his rant. But there is far too much bad history here, far too much insecure, self-serving selectivity, far too much dwarfish demonisation of the enemy and not enough objective confessional about how his own quirky, sometimes autocratic, style has sometimes led to the alienation of the causes that he espouses so passionately.... I only hope that this book brings closure to his political adolescence and gives him the success that he so richly deserves." - The Honourable Sir Maxwell MacLeod of Fuinary, Artwork. "I had at the end some niggling doubts. For one thing, Alastair throws himself into his activism heart and soul. This is an endearing quality but not necessarily something that we are all called to and it would have helped if he had acknowledged this." - Dr Margaret Hannah, Scientific & Medical Network Review, 2003. "McIntosh offers a revolutionary praxis which, as it actually worked itself out, never demonized its opponents but which continued to extend love and understanding to them.... The book has received wide praise, and can be read on many levels.... What has not attracted comment, and the reason for reviewing it here, is that it is also a book of theology.... Providing the backbone to the narrative of the whole book, is a theology of creation which draws on ecofeminist insights but which is also a robust theology of grace. This is what makes the book theologically important.... Here we have a liberation theology, emerging out of liberative praxis, in which Calvinism and ecofeminism are indissolubly fused to offer a liberation theology of creation.... As an unregenrate Marxist and Barthian I do not agree with all the theological and political emphases, but on the other hand this is without doubt one of the most creative pieces of British liberation theology ever written, and it deserves wide currency, debate and discussion." - Professor Timothy Gorringe, Political Theology, Continuum, 2003. "Soil and Soul is an extraordinary adventure in theology, economics, ecology, history and politics. To quote George Monbiot again, "It overflows with ecstasy, quiet wisdom and love - love for humanity, for the world, to our failings and possibilities...." We agree. This is an uplifting, empowering and inspirational read." Positive News. "I agree with George Monbiot as he concludes his Foreword with the words: 'Make no claim to know the world if you have not read this book.' This enchanting work will be read and discussed for many a long year." - Frances Hutchinson, The Social Creditor. "Most people will find things they disagree with: for me it was the Celtic romanticism, postmodern politics and deep ecology, though he makes a good case.... Agree or not, this is a powerful book about ecology, social justice and radical spirituality.... Almost reluctantly, I have to concede that this is a great book." - E.S., What on Earth (Friends of the Earth). "A book of passion and wit ... weaving a dizzying range of ideas into a bright fabric.... It is a book every Scot should read." - John Burnside, The Scotsman. "McIntosh describes the miracles that can happen when there is a recovery of the mythological underpinnings of a culture's psyche, as well as the feminine force of a people's soul and intuition bonded to the sacred landscape of place.... Very, very inspiring." - Sr. Miriam MacGillis, Genesis Farm Newsletter (USA). The back cover (right - hardback edition) gives crits from campaigning journalist George Monbiot, ecofeminist academic Professor Carolyn Merchant and life-sentence "innocent imprisoned" Tommy "TC" Campbell. At this time in history, everywhere on earth, we must redeem our relationship with the earth if we are to survive as a species. This Scottish-based work is vividly useful to people everywhere who care about reclamation in the full spiritual and practical sense of the word. - Professor Robert Greenway, Olympic Ecopsychology Institute, USA..
Alastair McIntosh’s Soil and Soul leads me on from my first reading of Paulo Freire’s Pedagogy of the Oppressed. The same thirst for justice, the same identification of the eloquent bard with the voiceless ones rekindles poetry and revolution in the readers heart and thunders forth “alarm! alarm!” as deep as any Biblical prophesy. McIntosh is able to leave one foot firmly planted in the old ways of a native Celtic people and the other slap bang in the middle of scholarly argumentation thereby bridging the great divide between poetry and science. He helps us to come to terms with our broken hearts and understand the dysfunctional power behind the carnage. 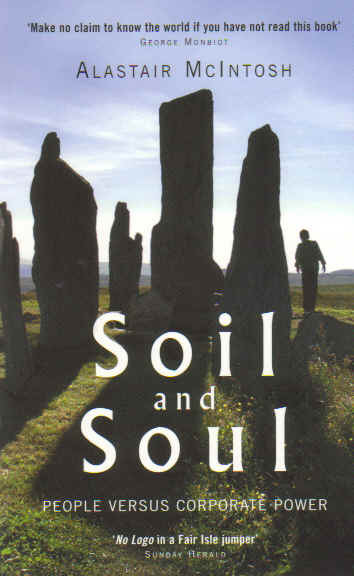 Soil and Soul is a major work which stretches us from the psychohistory of colonisation as seen through the lens of Hebridean culture to inspiring, empowering and entertaining case histories of community empowerment and cultural healing in which the author has played a pioneering part: read it! - John Seed, Australian ecological activist and author of Thinking Like a Mountain. 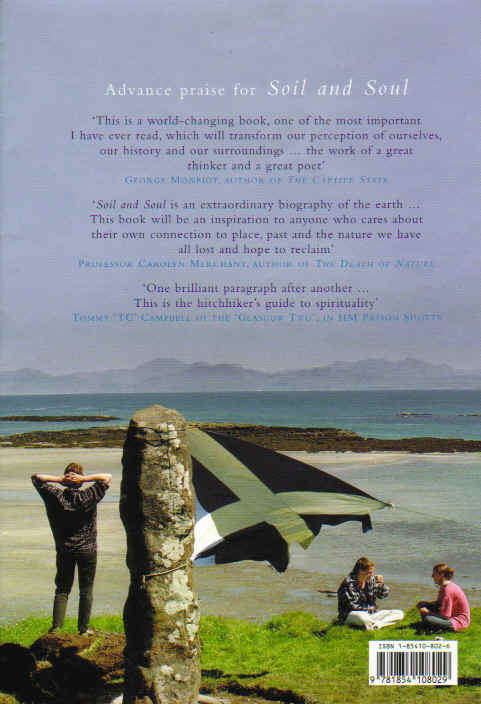 Back Cover (hardback edn): The Stone of the People, Isle of Eigg, erected 1987. Click here to return to the main Soil and Soul menu.